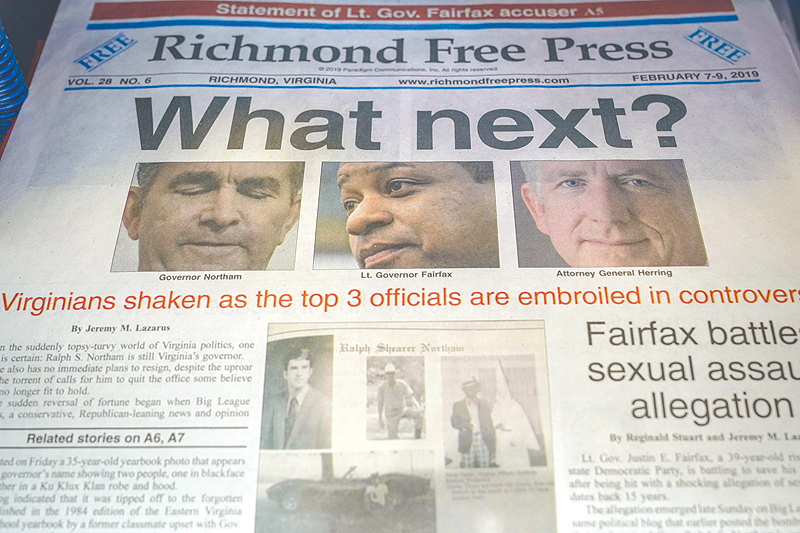 RICHMOND: Can a politician come back from revelations about racist behavior in their past? What if that behavior evoked the darkest chapters of American history, from slavery to segregation? That’s a question the state of Virginia has been grappling with since last week when its governor, Ralph Northam, was caught up in a row over blackface: the caricaturing of African Americans by crude methods of skin darkening as a means of entertaining white people since the minstrel shows of the 1830s. The 59-year-old has so far refused to resign after first admitting he appeared in a yearbook photograph showing a person in blackface and another wearing Ku Klux Klan robes, only to deny a day later that either individual was him. Northam’s deputy has since become embroiled in a sexual misconduct row while the next official in succession for the top job has admitted to engaging in blackface in college too. Sometimes known as the “Cradle of America,” Virginia was home to four of the country’s first five presidents. But it was also one of the most significant regions for the Atlantic slave trade, the main battleground of the mid-19th century Civil War that was fought over slavery, and later one of the states most resistant to the civil rights movement that brought an end to segregation. In 2017, the Virginia city of Charlottesville hosted an alt-right rally which saw a neo-Nazi ram his car into a crowd of counter-protesters, killing one and wounding 28. The Northam episode has shown “that Sweet Old Dixie is still around,” Minor, 44, said, using a nickname for the Southern states of the Confederate era. But a Washington Post-Schar School poll showed Virginians deadlocked on the issue with equal numbers for and against his resignation-and support for him staying in office higher among African Americans than among whites. Some like Reverend Dwayne Whitehead, the African American pastor of Richmond’s World Overcomers Church, argue forcefully against punishing Northam for decades-old wrongdoings. “I’m not as devastated by blackface and neither will I hold a person accountable for what they did 35 years ago, when this election for him as governor was not based upon who he was 35 years ago,” said the grey-suited 52-year-old. The blackface controversy has exploded into a full blown crisis for Northam’s Democratic Party after it emerged his deputy Justin Fairfax had been accused by two women of sexual misconduct, likely ruling him out of contention should his boss bow to calls to step down. The third-in-line to the governorship, Attorney General Mark Herring, has since pre-emptively announced he too wore brown makeup and a wig to imitate a rapper while in college in 1980.